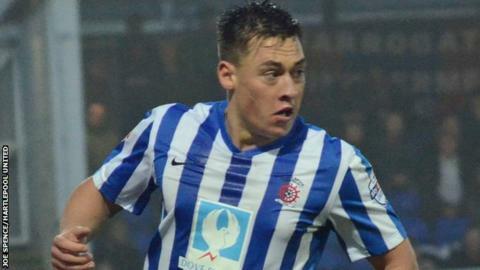 Scott Fenwick's top-corner strike gave Hartlepool their third successive League Two victory against Newport. The winless visitors enjoyed the better of the first half with the best chance falling to Mark Byrne, but they lacked a cutting edge throughout. Fenwick gave goalkeeper Joe Day little hope with a sweet strike from 18 yards early in the second half. Hartlepool were denied a second when Newport defender Regan Poole cleared off his own goalline. "The difference between the two teams is that when they had a shot they hit the target and we didn't. "It hurts your pride when you lose a game like that - you feel you've gone toe to toe but haven't got the points decision at the end of the day. "You feel perhaps you should've done more and landed a few more punches, but it hurts to lose." Match ends, Hartlepool United 1, Newport County 0. Second Half ends, Hartlepool United 1, Newport County 0. Corner, Newport County. Conceded by Michael Duckworth. Kieran Parselle (Newport County) wins a free kick on the left wing. Attempt missed. Scott Boden (Newport County) right footed shot from outside the box is close, but misses to the left. Attempt saved. Billy Paynter (Hartlepool United) right footed shot from the centre of the box is saved in the centre of the goal. Rhys Oates (Hartlepool United) wins a free kick on the left wing. Attempt saved. Aaron Collins (Newport County) right footed shot from outside the box is saved in the centre of the goal. Attempt missed. Scott Fenwick (Hartlepool United) left footed shot from the centre of the box is just a bit too high. Corner, Hartlepool United. Conceded by Mark Byrne. Corner, Hartlepool United. Conceded by Scott Barrow. Attempt missed. Mark Byrne (Newport County) right footed shot from the left side of the box is close, but misses the top left corner. Scott Fenwick (Hartlepool United) wins a free kick on the right wing. Seth Nana Ofori-Twumasi (Newport County) wins a free kick in the defensive half. Corner, Hartlepool United. Conceded by Joe Day. Attempt saved. Rakish Bingham (Hartlepool United) right footed shot from the left side of the box is saved in the top left corner. Attempt missed. Regan Poole (Newport County) header from the centre of the box is just a bit too high. Corner, Newport County. Conceded by Matthew Bates. Attempt missed. Scott Fenwick (Hartlepool United) left footed shot from the left side of the box is too high. Goal! Hartlepool United 1, Newport County 0. Scott Fenwick (Hartlepool United) right footed shot from outside the box to the top right corner. Attempt missed. Scott Harrison (Hartlepool United) right footed shot from the centre of the box is just a bit too high. Corner, Hartlepool United. Conceded by Regan Poole. Foul by Kieran Parselle (Newport County).